As much as I will miss our home when we move, I have to admit I do get excited at the thought of a brand-new kitchen and bathrooms or renovating a kitchen or bathrooms. We have been looking at homes and have seen a couple that would work; but in every one I would want to renovate and update bathrooms and kitchens. We've built a house, but I've never renovated existing rooms and I'm very open (in fact excited) to do so. To that end, I've been ‘window shopping' for ideas for new kitchens and bathrooms that I'm thinking of using in our new home. Wanna join me in a little window shopping? So, let's start with some basics and work towards the pretties. Just a wee housekeeping note, if you decide to pin any of these inspiring images…please go to the link under each image to pin from the original source. Many Thanks. Since we're in the loo, the logical place to start is … the toilet. A new trend is the one-piece toilet. As the name implies, these toilets are a seamless single unit and typically take up less space. Removing all the nooks and crannies that need to be cleaned is a big plus in my book (17+ years as a boy mom has certainly influenced my thinking in this arena). I will also be glad to upgrade to the higher efficiency in terms of water usage that newer toilets offer. Leslie's bathroom has so many fantastic features, I just don't know where to begin. But, since we are in the ‘stand alone tub' section of the post, let's start there, but then let's not forget those fantastic brass fixtures! Leslie also incorporates another trend I have always liked which is bringing furniture into the bathroom. That settee and little side table add so much personality to this space. Check out more of this bathroom at Paper Daisy Design. Given adequate screening, I'm also a fan of lots of natural light and air in a bathroom. This one accomplishes that in addition to that oh so chic tub. Kristi's farmhouse bathroom would not be complete with this lovely stand alone tub…and pop over to see what she used for her vanity. Just perfection. A couple tile trends I'd like to embrace in our new home are the Encaustic/Inlaid tiles and Concrete/Cement tiles which are popping up everywhere and the idea of mixing tiles/patterns. Not only is the floor in this bathroom just beautiful, but I do like how it appears to run seamlessly into the shower. I would assume that there is a sweep on the bottom of the door to keep the water from running underneath. And that frameless shower isn't too bad either. 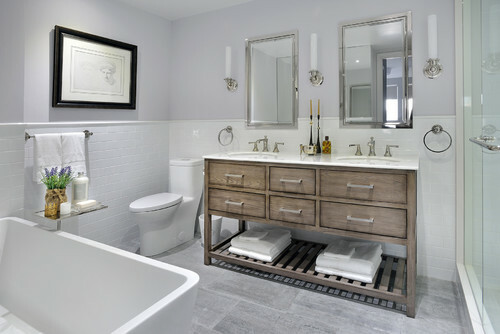 Jenna's powder room is so serene with that beautiful gray and white cement tile. And I'm all about those brass fixtures as well. There are so many facets of this bathroom that just really speak to me, but think I would keep the tile just on the floor. But that vanity…and that sink…and that tub…and that tile…and those brass fixtures. Yup everything else is calling to me. There is something about this bathroom that whispers…'ahhhh…..' And who among us couldn't use a little more ‘ahhhh….' in our day? Once again, the tile is gorgeous, that stand alone bathtub is perfect and still crushing on that framless shower…do you detect a trend here? And I'm digging that brass fixtures are making a comeback! Go Brass! Angela from Blue I Style used that lovely tile only on this one wall…what a fantastic statement! Where to start on this one…of course the floor tile, but the entrance to that shower is just charming. That built in seat would be so very handy and I have always been a sucker for subway tile. Talk about ‘crisp'…this one has it in spades. Think that black trim against the white is what just nails this one, in addition to that floor. And while I've been thinking gray and black tiles, this brown and white one caught my eye…just a little softer. I do like the idea of mixing tile and tile patterns and Rhonda at Southern Hospitality nailed it with her recent bathroom renovation. And I couldn't leave the whole tile scene without giving a shout out to my friend Robin at A Home to Grow Old In who STENCILLED (yes you heard me right) her existing bathroom floor in this fantastic cement tile pattern. I have always liked using things in unexpected or nontraditional ways and the bathroom is no exception. Turning this buffet into a vanity is my idea of just that. And bringing this armoire into the bathroom for storage is just brilliant. We currently have 3 bathrooms in our home with ‘furniture' for vanities; this one is in my daughter's bathroom. What a great idea for an old desk! Wow, I'd love to have this table anywhere, but it does make a stunning vanity. My friend Angie at Postcards from the Ridge turned her dining room buffet into a vanity and it's so very lovely. And check out this beautiful chest in the master bathroom of my friend Robin…in addition to that tub and wallpaper! I have been ‘eh…' on wallpaper for quite some time, but my thinking there is beginning to change. Wow…I'm sure I have flat out exhausted you…and I didn't even touch on brass fixtures and lighting like I had planned. But all this window shopping is making me anxious to get this house sold and move on so that I can incorporate some of these lovely ideas in our new home. As always, I am so thankful that you decided to spend a few minutes of your precious time with me today. I appreciate your company and your comments more than you can know. If you want to make sure you don’t miss future content, pop your email in the beige box up on the right or click here. I usually send out 2-3 emails a week, so I won’t inundate your inbox…believe me, I’m sensitive to an overflowing email inbox! This post was a collaboration with Decoraport, but all opinions are 110% mine…I promise! Love the stand alone tub. We are seeing the cement tiles pop up in designs now. We love it! I love the look of a stand alone tub, but my concern is how difficult it would be to clean around it. We have an antique clawfoot tub in our current home (getting ready to sell and build a smaller retirement home) and it’s a true dust collector behind. SOOOO hard to get behind to clean. Plus I just repainted the beadboard in that bathroom and it was next to impossible to get behind the tub.